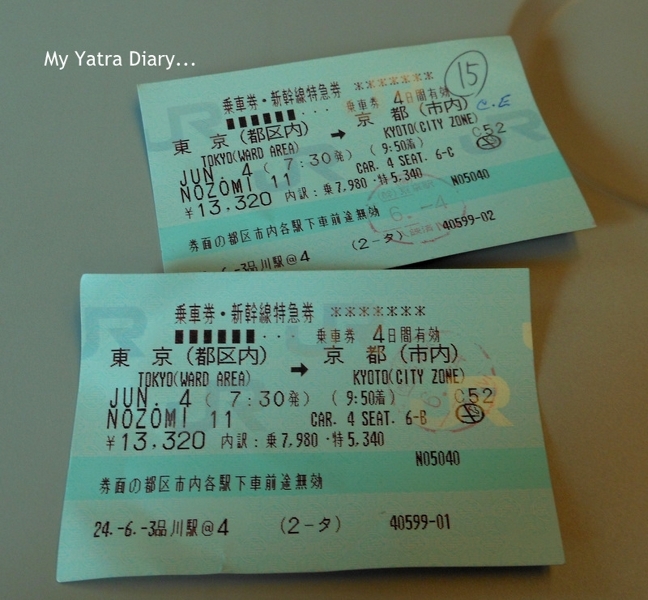 The first thing of the Bullet to hit me, a budget traveler to Japan, surprisingly, was not it's speed but it's cost! 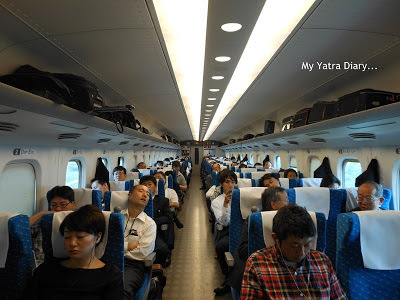 With the tickets priced at 13500 Yen per person from Tokyo to Kyoto, traveling in the world’s fastest train - the Shinkansen also known as the Bullet Train – was always going to be a costly affair. But I was the last one complaining and I had some very good reasons for it! 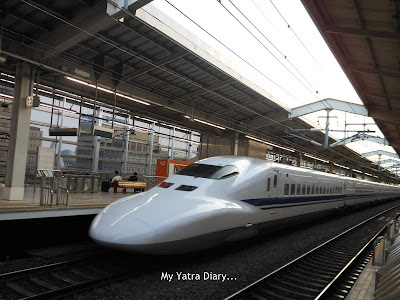 'Riding the Bullet or the Shinkansen' was something I had excitedly waited for, ever since I had won the all expense paid Japan trip (courtesy IndiBlogger and Expedia). One, because it meant experiencing a ride in the world’s fastest moving trains and two, because it meant an exciting meet with 5 special people who had, until then, shown me the beautiful world of Japan via this amazing world of blogging. Interiors: As I stepped into the world’s fastest train, the feel was thrilling to say the least. The interiors were such that they could have easily passed off as that of an airplane complete with neat and clean spacious seats and aisle area, together coupled with a peaceful soothing ambiance. An inside view of the Shinkansen: Doesn't this remind you of an airplane? Speeding views: I jumped at my pre-booked window seat and excitedly waited for things outside to begin zipping. I imagined them to just go whoooooooosh but was pretty disappointed when I saw that things weren't that fast as I initially pictured them to be. Even though the bullet moves at very high speeds (240–300 km/h), you never really feel it while traveling and you can actually ‘see’ all the views and enjoy the passing landscape outside. If you are interested in enjoying it's speed, then you need to step out of the train, stand on the platform and watch it zoom. That is when you get an idea on why exactly the train must have been named as ‘The Bullet’. The Shinkansen has a protruding nose and a rocketing machine that vanishes out of your sight in a matter of a few odd seconds when triggered. It may sound a bit strange but the fact is that I found it much more interesting to watch the bullet zoom by rather than zooming on it myself, which ideally speaking should have been the case! The Ticket Checker was one of the highlights of the train - He comes, he smiles at you, he punches your ticket and wishes you a good journey ahead. He followed this same particular pattern for each and every passenger still it never looked mechanical or a part of his job, such is the gentility embedded in the very character of Japan. Stepping out of the train was thrill too! And to add something more, I had butterflies raging in my stomach! I was nervous, anxious and excited... all in equal measures. And why not? A world which was waiting to welcome me with open arms, it's people all geared up to illumine the heart of one sunshine face they had met virtually with their tender love, kind affections and beautiful smiles. 1. If you aren’t sure of your time of travel, only then go for an unreserved ticket. Otherwise, it is always good to reserve your tickets even though the charge might be slightly higher than its unreserved counterpart. 2. Seat reservations can be made in person at ticket offices of all major JR stations across Japan. Any shinkansen can be reserved from any JR ticket office in Japan. 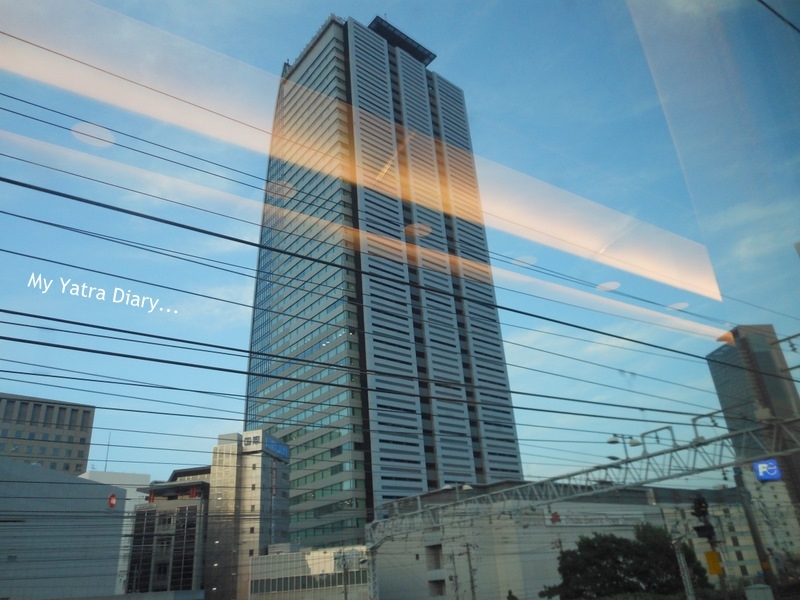 We booked our Nozomi bullet train ticket for Kyoto a day before from Shinagawa railway station and caught it the next day from the Tokyo railway station. 3. Green cars are luxurious vis-a-vis first class of air travel. Go for the ordinary car if you wish to travel cost-effectively. Ask for a window seat while making your bookings. The frequency of trains is very good with one train running almost every half an hour. 4. Remember, the trains are known for their punctuality and leave the station dot on time! But in worst cases if you miss your scheduled train, do not panic. Tickets can be easily cancelled for a full refund. 5. Reserve your tickets a day before so as to ensure availability of a seat and also to avoid any last moment hassles on the travel day. 6. If you take the Shinkansen from Tokyo in direction of Nagoya, Kyoto and Osaka, do not forget to check out for Mount Fuji. 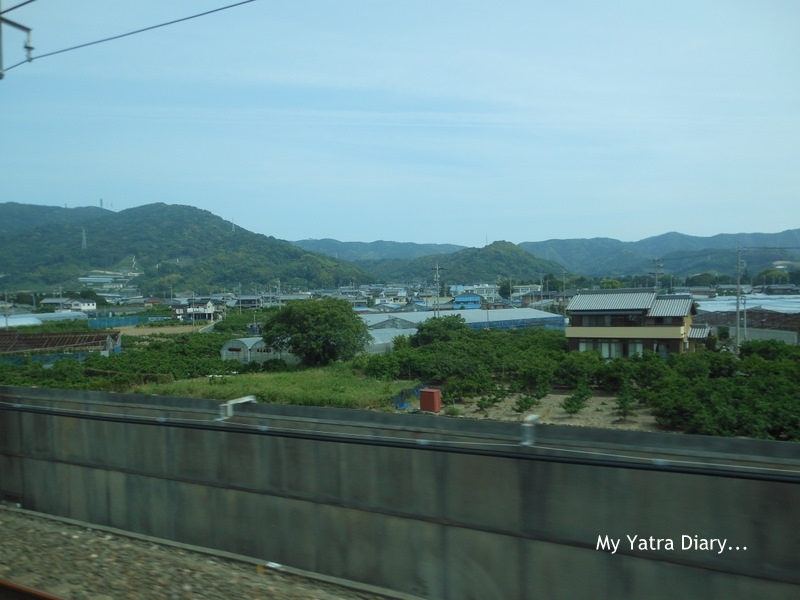 It can be viewed from around Shin-Fuji Station on the right hand side of the train, about 40 to 45 minutes after leaving Tokyo. We weren’t aware of this fact and missed it altogether. That is an awesome experience well narrated. Would love to be on it someday. Oh you took fantastic photos in the train! 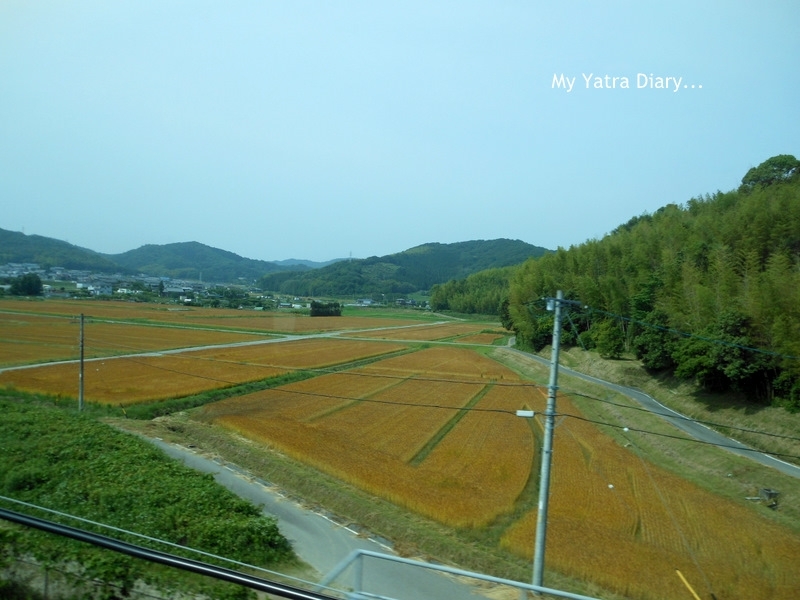 @Arti Wow , great to read about your journey in Shinkansen, Awesome. Beautiful description with photos. Thanks a lot. now thats one train I want to be on, someday! Arti, I rode the Bullet Train in the 80’s when it was new. I remember that it seemed very fast back then compared to other trains I had ridden. I do love trains and this looks like such a great one! Marvelous captures as always, Arti!! Thanks for sharing your adventures/travels with us!! How exiting Arti! This train so fits to Tokyo. Would like to ride an old fashioned train - like in the Film arjeeling Limited through India one day! Have a happy midweek! A friend of mine spent two weeks in Japan as part of a teacher education program and really enjoyed her trip on the bullet train. And, most everything else about Japan. The Bullet train will be in Kyoto soon! I look forward to seeing you in Nara! Going on a bullet train in Japan definitely needs to go on my bucket list! Great pics. It looks so clean! I love the ticket collector's uniform. I remember I saw Mt. Fuji from inside the bullet. It was more than 10 years back. This gives me an idea of what it looks like, never seen one nor even ride on one. That looks like a first class accommodation. he he he he :) for some reason when you said bullet , I had this image of a royal enfield bike in india BULLET :) how wrong I was ..
and now that you have said I too was underimpression that bullet would be wooooshhhhhhhhhhhhhhhh .. It's nice to see your experience to get on Shinkansen. Ticket Checkers would be kind,I think. that sounds like a wow train to be on. Loved the way you have said it was more enjoyable to watch it zoom past than zooming in it :) It takes all kinds of experiences to enjoy oneself, right? Wonderful experience. I too could get a feel of it through your narrations. What a great way to travel! I love the lush countryside you saw along the way. Yet another thrilling event, its a joy to share these experiences with you. How interesting this is....I would have thought it would feel faster inside too (but I guess an airplane doesn't really feel like its going fast either once you are in flight).... The train is definitely more beautiful inside than I would have thought it would be. And so interesting about the ticket taker. Awesome.. Interesting narration as usual Aarti..! I'm curious how fast the train there Arti.. :)From the story i hear it's superb ..
Great capture of the train. The inside of the train looks amazing and spacious indeed! Fantastic photos! The shinkan-sen is comfortable and fast but costly. It's about as same as flight. Thank you for expecting to Nara! Fantastic post! It's been a dream for me to try the Shinkansen one day. The train is real iconic. Love the speed. You should also try the Maglev trains in Shanghai one day. I think it has a max speed of around 420km/h. Wonderful to read of your journey on the Bullet Train and looks very comfortable and like an aeroplane. The trains we caught in France went about the same speed and you can travel a long way in a short time. Didn't know you got to ride on Bullet train too. That would have been some kinda experience. Eversince my Childhood I too is fond of travelling in train. They simply looks superb there in Japan very neat and clean. That one is there on my wish list! Hmm! we didn't get the chance to ride the Shinkansen last year but did see it at one of the stations. Thanks for the tips (for next time) and letting us virtually ride with you. What a great experience! 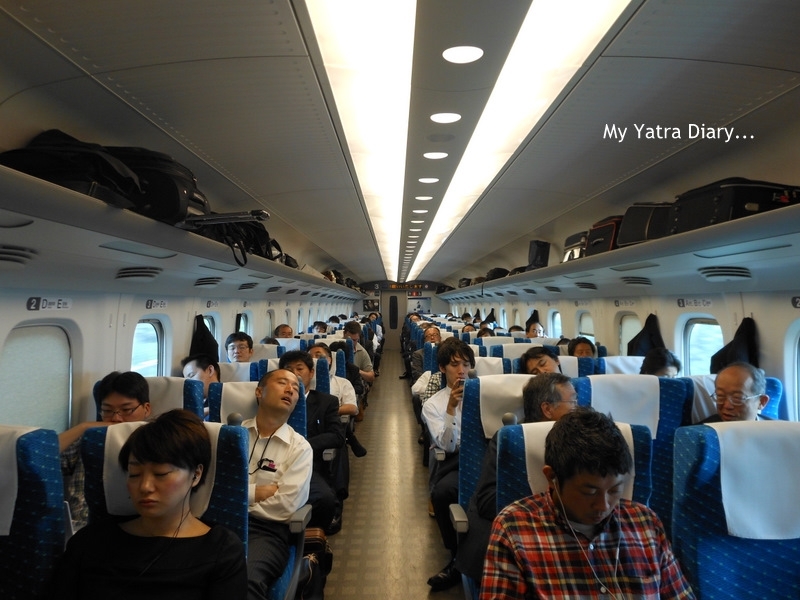 Oh, Arti, I can feel your elation in riding the world’s fastest train to jump into the arms of Nara Friends. Arti, I came here through Zephyr's blog ! I just read through all your Japan posts and loved them !! I have spent about five years on and off in japan and still travel there for work. It is one of my favourite countries ! Your posts really took me down the memory lane - loved your insights about the country and its people ! Heard that Kyoto has lovely temples and old buildings. Hope you visited some. It's a dream of mine too, Arti. I'm glad to hear that tickets are refundable. That's a good thing, especially since they're so pricey. How exciting for you! This reminds me of my first and only ride on the Shinkansen. It was only a short trip, but worth the experience. I know what you mean of it not feeling the speed and still have the ability to see out your window without it having to be a blur. I enjoy reading your informative posts as always. 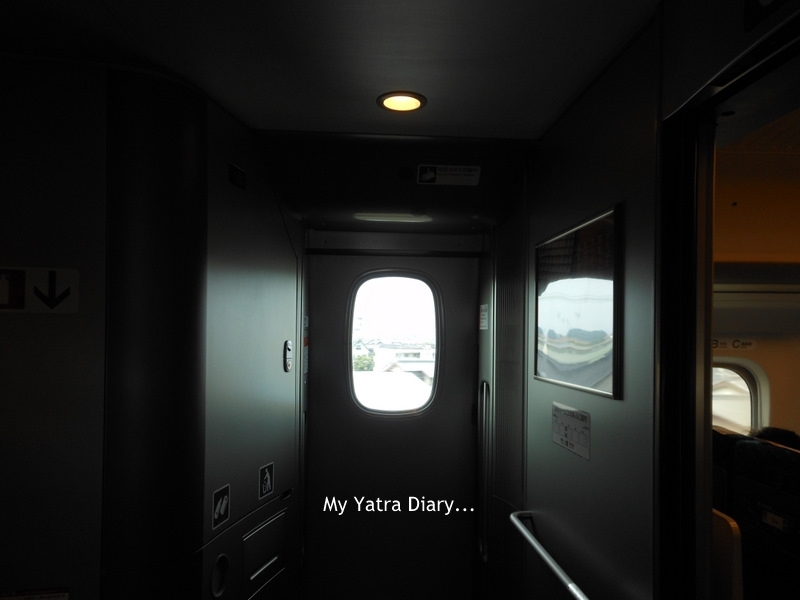 You are the very first person I have ever heard about their experience riding the bullet train. I am so glad you had a wonderful time. I think it is an amazing new technology. Why we don't have more all over the world. Those speeds are a little scary. Thanks for sharing your take on this means of transportation to get around. Despite the killer speed the photos you have taken from inside the moving train are quite clear! Is it due to the slow speed while they were taken or your fast shutter speed? lovely pics! and great writeup...sounds quite exciting to have been on this ride!! As usual you make people travel along with you through your blog, Arti! And that was a thoughtful tip to ensure others did not miss what you were unfortunate enough to miss. Arti your posts on Japan rouse a lot of admiration for that country & it's people...how do they do it? & why are we so dirty & untidy with regard to public places ?A lot to learn from that country!! Wow, look at that machine, it looks awesome. I wish such technologies reach the Indian shores as well, so that even Indians can enjoy their travel. The Chinese are way ahead us in terms of technology and developments. Lovely post on a fav. topic of mine. I have heard about this journey , years back!. On my bucket list too. Lovely photographs , and write up . Wonderful shots of the train. Heard a lot about this train before. yes!..totally when you said bullet for once I thought enfield in japan!>.. well, japan is one on my list too!.. As a Transport Planner, I've studied much about bullet trains - but never knew that you could see the outside clearly - hows that possible? Hi Arti, what a wonderful description. The train must have been super smooth for you to be able to glance out the window at such a high speed. I haven't been to Japan yet but this calls for a trip soon....specially to see the smiling conductor. That's an interesting piece. 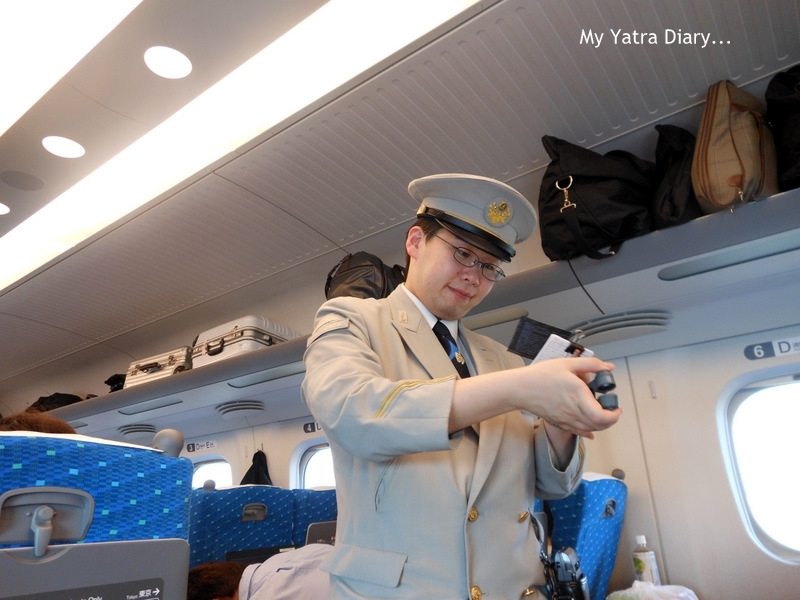 And hey, that ticket checker is cute! What a ride it must have been!! The train looks sooo cool. I'm envious!